SD Ireland’s Tyler Skaflestad makes a nice play at second base during their game vs the Colchester Cannons on Wednesday the 5th. 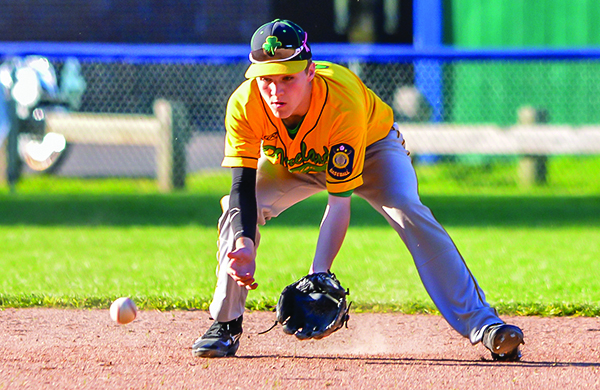 The odds were stacked against the SD Ireland legion baseball team on Tuesday at the Vermont legion state tournament. Facing the top seed in a tournament the SD Ireland barely snuck into — and already having one loss in the double-elimination format — the team smoked the Colchester Cannons 16-2 to advance. The win advanced SD Ireland to the semifinals, where it was scheduled to face Post 84 (White River Junction) at 4 p.m. on Wednesday. The winner of that game advances to the 7 p.m. championship game. Rivers pitched all seven innings to earn the win for the 19-21 SD Ireland team. He allowed just two runs on three hits, while striking out seven. While Rivers was taking care of the Cannon (20-9) bats, the SD Ireland offense got hot, with 12 hits and 16 runs. SD Ireland got on the board in the second inning with three runs, added six more in the fourth and put it out of reach with four in the sixth and three runs in the seventh. Tyler Skaflestad, Hunter Anderson, Collin Vincent and Hank Caswell each had two hits for SD Ireland, with Caswell and Hagen Harris each driving in three runs. Liam Reiner, Anderson and Vincent each drove in two runs. “At the plate, we have been attacking the zone, getting into hitter’s counts,” Albertson said. The deep playoff run is something special for SD Ireland, which needed another team to lose on the final day of the regular season to get into the postseason. The renewed effort is in part for teammate Storm Rushford, who was recently diagnosed with cancer. SD Ireland fell in the first game of the tournament to White River Junction in 10 innings on Saturday. The team rebounded with a 3-0 win over Brattleboro on Sunday.